G. Scott MacLeod's art consultations are designed to help students improve their portfolio for the school application process and help artists with their business practices. "I just wanted you to know that I received my acceptance to McGill in Architecture. I know that I couldn't have done it without you and I truly appreciate all the time that you gave to me as well as all the great ideas that we used in the construction of my portfolio. Thanks to your private courses. I was able to construct a well-rounded and complete portfolio, which I'm sure played a HUGE part in getting me accepted to McGill." I would like to thank you very much for all the help you gave to our two Alexes. James Lyng has had a number of excellent artists in the past who have not gone on to Fine Arts at CEGEP for several reasons: lack of confidence; lack of ability to put together a portfolio and a fear of not making enough money to live, among others. Before you kindly offered your services, neither student had been considering a career as an artist, although they had been involved in the making of murals on the walls of the school. With your help both students were able to put together excellent portfolios and managed to impress Dawson enough to accept them. Your non-judgmental approach helped them develop confidence over the course of their time with you. Their visits to your studio where they were able to paint and be exposed to a positive environment, introduced a new way of life which many students do not have the opportunity to see. When they were accepted at Dawson, they were on cloud nine for days and are very eager to begin in August. Thank you Scott for all you did for these students. You went well beyond what I expected when I asked you this favor. I do hope we can work together again. "I just wanted to thank you for your informative lecture yesterday! This is not the first YES Artists conference I have attended, but definitely one of the strongest ones. It's nice, for a change, to see more focus placed on the business and networking side of the artist's world." "I just wanted to thank you for the consultation you gave me regarding my future as a photographer. Your years of experience and education as an artist gave me the tools and resources I needed in order to research potential residencies, grants, and organize my portfolio in the best manner. In a brief consultation, I have all the information I need to start the research in the field of photography, which will keep me busy for some time. Also, your experience in the art milieu helped me better understand what the contemporary themes are, and what I need to doing order to get my work out in the real world." 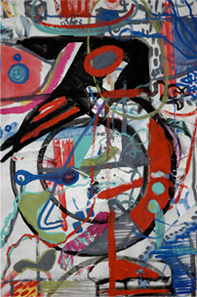 "Scott MacLeod exhibited his Viking-related art at the Swedish American Museum from June 13th to September 31st, 2002. It was a very well-received exhibit with good attendance. Scott came to Chicago for the opening and gave a short talk about his research and art. He also gave a much appreciated gallery talk a couple of days after the opening. Scott has gained a wealth of knowledge about the Vikings but what is so remarkable is that he has an ability to relate it to young people and make them excited. Scott has a very special way of engaging people in his projects." 1. 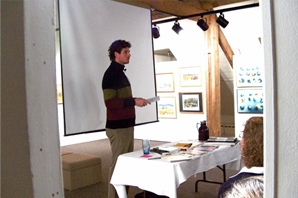 What an Artist Should Know About Self Promotion; In this lecture Scott offers both the emerging artist and the experienced artist practical information about portfolio presentation, gallery exhibitions, marketing and selling artwork, grants and art residency programs. At each group lecture, he will provide handouts with the information covered in this lecture. Duration: 30 minutes, question period 30 minutes. 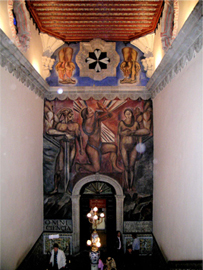 This lecture addresses the social implication of muralism from the early Aztec and Mayan muralist who influenced the Mexican muralism, focusing on, los tres grandes ("the three great ones") Diego Rivera, José Orozco and David Siqueiros, each of whom also worked in the United States at some point in their artistic careers. The movement's influence subsequently spread throughout North America, acting as the primary inspiration for the Works Progress Administration's art movement (WPA) of 1940s America, which sought to employ artists through government patronage. 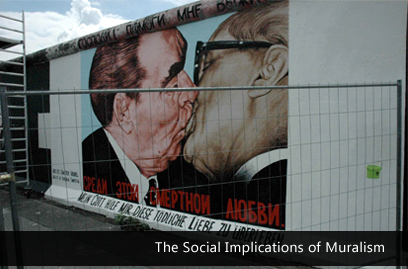 The second half of the lecture deals with the Canadian art collective La Raza Group, who were initially influenced by Mexican, Northern Irish and Berlin Wall murals. La Raza began its exploration into the realm of public art making – an art form that found its forum in the public sphere outside the white sterile walls of the museum or art gallery. Its discourse was with everyday realities, a commentary on life on the street, urban experiences and the ever-changing social and political situation. Duration: 45 minutes, 15 minute question period. 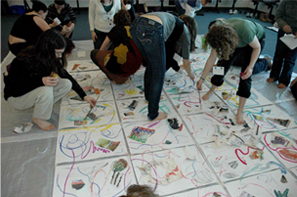 The aim of this workshop is to experience drawing, painting and collage without the hang up of ‘making a mistake’. Scott can assure you, that there are no mistakes when it comes to making marks on paper. As children we have all made art freely, from any formal training and enjoyed the pure pleasure of the creative process. Like drawing with a stick in the sand, this workshop is designed to bring you back to that free state of being, enabling the absolute beginner to simply enjoy the creative process once again. 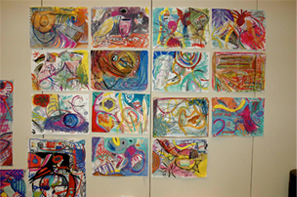 Collectively, Scott will walk you all through the journey of painting, drawing, and collage. He will teach you how to paint with gouache from three foot brushes, draw with oil sticks, and tear the drawings up to only rebuild them again with collage. This collective workshop experience, will enable all to understand how to ‘flow and let go’ openly with the mediums provided. Once you have done this workshop, you will be able to share it with others and apply the same methodology to all aspects of life. Scott looks forward to meeting you all and sharing this creative process with you. "There are no mistakes only possibility." Duration: 45 minutes, 15 minute discussion period. As part of his ‘Flowers in the ashes’ workshop, Scott will present his short documentary and a selection of his soundtracks back-to-back, with aim to discuss what Canadian Filmmaker Velcrow Ripper (Sacred Sacred) describes as finding the ‘flowers in the ashes’ and looked for the positive lessons out of the atrocities of war. 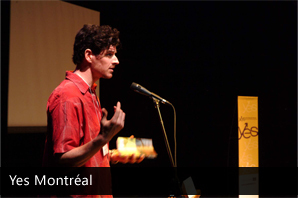 Scott will also discuss the creative processes in film and music production. This presentation provides the audience with valuable life insights into the business and art making processes of film and music production. 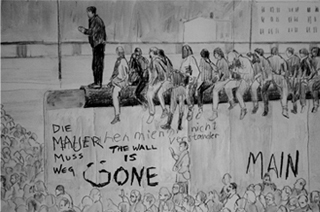 Synopsis: Using a mix of period photography and film, captivating pencil animations and live-action footage, director G. Scott MacLeod has crafted both a moving personal portrait of the unforgettable Hannelore as well as an artful look into the reality of growing up in Berlin after the Second World War. MacLeod Nine Productions, MAIN FILM, and The National Film Board of Canada Filmmakers Assistance program. Duration of film and lecture : 60 minutes, followed by a 15 minute discussion period. G. Scott MacLeod received an Attestation of Collegial Studies from the Ministry of Education of the Province of Quebec in Fine Arts from John Abbott College, and a Bachelor of Fine Arts with a specialization in Printmaking from Concordia University in Montreal. He has been a professional artist since 1987. He has organized and curated international exhibitions, worked in art collectives, self-financed, promoted and launched his own projects and career. G. Scott MacLeod is an award-winning international multimedia artist with more than a 150 exhibitions to his name. His work has been presented in Canada, Germany, Ireland, Italy, Mexico, Norway, The United States, and The Czech Republic. His work is in many corporate collections and museums. Most importantly, G. Scott MacLeod has made his living exclusively from his art since 1987. 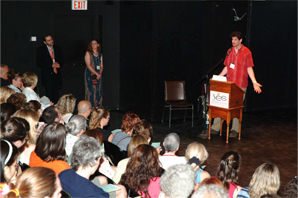 2010 Hudson Film Society, After the war with Hannelore, lecture and screening. 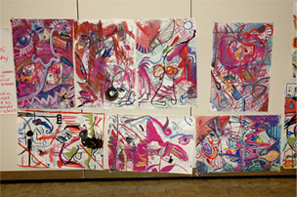 2010 Dollard Artist Association, Social Implication of Mural Art, Montreal, Quebec, Canada. 2010 Stewart Hall Cultural Centre, Social Implication of Mural Art, Montreal, Quebec, Canada. 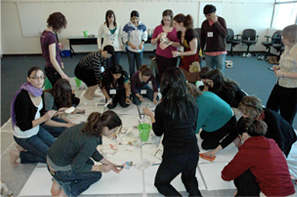 2009 Think Again Conference Canadian Millennium Scholarship Foundation, There are no mistakes, collage, painting and drawing workshop. 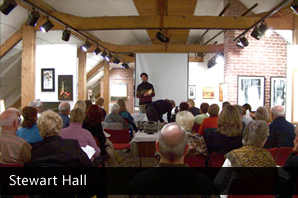 2008 Stewart Hall Cultural Centre, After the war with Hannelore, animated video storyboard screening. 2008 Westmount Library, La Raza Group - Outreach, Montreal, Quebec, Canada. 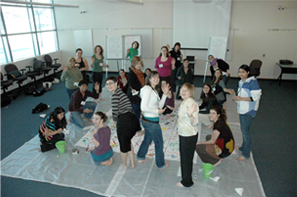 2008 Concordia University, One Is the LoneliestNumberArt Matters Panel Discussion, La Raza Group - Outreach, Montreal, Quebec, Canada. 2007 Stewart Hall Cultural Centre, La Raza Group - Outreach, Montreal, Quebec, Canada. 2006 Society of Canadian Painters, What an artist should know, McAuslan Visitor Centre, Montreal, Quebec, Canada. 2005 5th Montreal Self-Employed Artist Conference, Marketing Artists, for Yes Youth Employment Service, Centaur Theatre, Montreal, Quebec, Canada. 2004 Dorval Public Library, Similarities between Mexican, Celtic, First Nations and Viking art, Montreal, Quebec, Canada. 2004 Stewart Hall, What an artist should know, Montreal, Quebec, Canada. 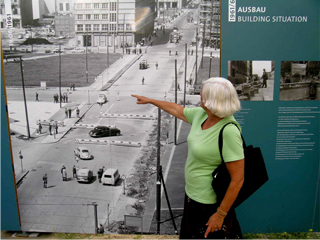 2004 McAuslan Visitor Centre, The Lachine Canal Past and Present, Montreal, Quebec, Canada. 2003 The Westmount Library, Similarities between Mexican, Celtic, First Nations and Viking art, Montreal, Quebec, Canada. 2003 Westmount Visual Arts Centre, What an artist should know, Montreal, Quebec, Canada. 2003 Nordic Heritage Museum, Ancestral Homes project, Seattle, WA, USA. 2002 Swedish American Museum, Ancestral Homes project, Chicago, IL, USA. 2002 Svenska Klubben I, Ancestral Homes project, Montreal, Canada. 2002 Concordia University, Montreal, Quebec, Canada. 1999 Bishops University, The Starving Can’t Eat Stone, the Irish Famine of 1847 and the decimation of the plains buffalo, Lennoxville, Quebec, Canada. 1987 - 1983 Banff Center School of Fine Art, Montreal art collective La Raza Group, Banff, Alberta, Canada. 1995 Art Gallery of St.-Thomas and Elgin, Ontario, Canada. 1991 Dawson College, Montreal, Quebec, Canada. 1988 - 1991 1991 John Abbott College, Ste-Anne-de-Bellevue, Quebec, Canada. 1987 University of Queretaro, Queretaro, Mexico.